Winter weather isn’t necessarily an older adult’s acquaintance, and with winter weather, comes illnesses galore. From a slight stuffy nose to a full episode of the flu, around 60% of older adults come down with some sort of symptom(s) of these illnesses. In the 2013-2014 season, hospitalization rates among seniors aged 64 and older were higher. Those aged 50 to 64 were second highest in the ranking, and were higher than previous years, resulting in the season being compared to the 2009 pandemic with the H1N1 virus. Young adults were also affected, however, it was in older adults that took the increase in flu-like illnesses. The influenza (“flu”) is a highly contagious virus that happens in the respiratory passages. A case of the flu can last anywhere from a couple of days to around 2 weeks. While flu season goes on from around the middle of October to the end of May, other illnesses occur during the winter weather as well. 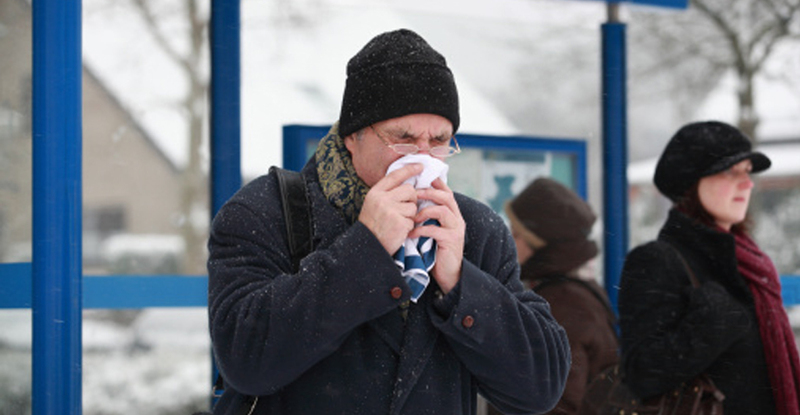 For example, the common cold shows its face during the cold temperatures. Others include just a regular sore throat, pneumonia, asthma, norovirus (“the stomach bug”), cold sores and fever blisters, and heart attacks, which are common during the winter due to the increase of blood pressure. With many illnesses spreading around during the cold season, it’s difficult to tell that you show symptoms until it’s too late. Luckily for you, we’ve collected a list of symptoms that you can experience under these sickening circumstances to help you stay above the illnesses. Check Yourself Before You…. Get Yourself Sick! Washing your hands regularly will kill the amount of germs you come in contact with. After you use the restroom, before and after you begin an activity, and around every 2 hours or so should help you limit the interaction with germs that lead to flu and other illnesses. Stress relievers can help limit your chances of catching the flu and other sicknesses. Taking a hot bath, going for a walk, or listening to slow acoustic music can reduce stress and keep you at bay. Stress is a major cause of many ailments, so reducing the amount of tension in your routine can help strengthen the shield against the flu and other viruses. Cold weather conditions have a great effect on you and your skin. The winter wind can leave your lips chapped, your hands cold from lower blood circulation, and your skin drier than a droughty desert. So, for many beneficial reasons, take warm showers rather than hot as hotter water dries the skin out more. Hot water will also dry your hair out, leaving it dull and lifeless. Tip: Use moisturizers daily. Contrary to popular belief, they don’t absorb into the skin, but act as a sealant to protect the skin from harsh conditions such as winter weather. Warmer clothing will also help with dry skin, cold hands, chills, and so on. Keeping warm is one of the best ways to fight off any virus that is trying to make your body its host. This will help maintain blood circulation and prevent severe conditions like pneumonia and hypothermia. Now that you are equipped with the proper weapons to fight against the winter sicknesses, you can go on about your day taking better care of yourself.